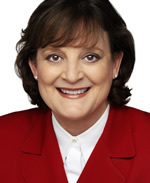 Celeste Bottorff is vice president of Living Well for Coca-Cola North America in Atlanta. Her work involves collaboration with leading scientists, policy makers, and opinion leaders regarding obesity and active lifestyle issues and development of consumer and employee messaging and advertising regarding Coca-Cola’s products and community involvement. Bottorff started her career at Fermi National Accelerator Laboratory, where she worked in accelerator operations. She also worked for consulting giant McKinsey & Company, where she focused on technology and marketing practice groups. In addition, she has served as the senior vice president of strategy and marketing for AHL Services Inc., marketing director for theAtlanta-Journal Constitution, and director of global planning for Intercontinental Hotels. She is a board member for Caraustar Industries, HireDynamics Inc., and the Cystic Fibrosis Reaching Out Foundation. She has served on both the Purdue University Science Alumni Board and the Dean’s Leadership Council.